Why not just set a goal and go for it? I need to clarify something here.  Unscribbling is NOT about goal setting. However, investigating your goals and wants can help you unlock the secret of what your true desires are by looking at their essence. The other reason it’s not about goal setting is, well… personally I’ve always hated goals – goal–setting and all that crap. I have actually found that it works against me. So I don’t set them. Goal–setting may work for some people, but it always seemed that when I tried to pursue a specific “goal,” suddenly there was all this pressure that went along with it. That pressure usually hurt me in the pursuit of my goals more than it helped me. “Gain 3 new clients this month.” Sounds good, but in my quest to get three clients, how do I make sure they are going to be the right clients for me? And in the pursuit of “landing” these clients, am I making sure I’m actually providing a service they need? Or am I just meeting my sales quota? Can I handle three new clients a month? “Ask out 3 guys a month.” My friend said, “It’s a numbers game.” Ah, but what if I only find one guy I’m interested in? Or what if I start to date three people, and I can’t keep all their stories straight? The “confusing their stories” scenario seems VERY likely. And where am I going to find these guys? That could be a lot of bars to visit. “Read a book a week.” What if I decide I want to take a tango class one month, or I get sick one week, or what if ALL three guys want to go out in the same week? That might be pretty hard to read that week. “Lose 5 pounds by next week.” Is that even healthy? Or is it just supposed to be two pounds a week…. I can’t remember. I might be able to do it if I eat nothing but fruit…. but that will probably give me the runs. I’ll definitely be cranky – I’m always cranky when I’m hungry. That’s probably not going to make those dates go well. Agghhh!!! Pressure! And what if I can’t do it? Now what?!!! I was discussing my loathing of goals with a friend who was baffled by my “lack of goal setting” philosophy. He could not figure out how I had accomplished so much in life without having goals. After all, isn’t that how you are supposed to get somewhere in life – set goals and strive for them? Well, that may work for some people, but not me. I prefer to follow my desires and see where that leads me instead! Plus it is much more fun. Having the desires in my mind, and staying open to the possibilities, is how I decided to start my business. The project with my full–time employer was winding down after two years of steady work. It was a perfect opportunity to go out on my own and have them become a client, which would allow me to gain other clients, explore the world of other businesses AND do more design work. Had I started with the goal to “start my own business by the time I am 26,” I might have opened a restaurant instead; but that probably would not have fulfilled my deeper desire to learn about multiple areas of life and do more design work. Staying clear on my desires brought me to a business that I truly love and enjoy doing. Once you become clear on what you desire, you SEE the desire. Then you can set your INTENTIONS. When you set your intentions, it’s like you send a message to a little worker bee in our mind with a periscope. The little worker bee is called into action keeping an eye out for good solutions to fulfill the desire. But the worker bee needs its marching orders. That is why it is necessary to first become aware of your true desires – so opportunities are not passing you by that might be perfect solutions for you. Takeaway: By identifying your desires, you open yourselves up to ways of successfully accomplishing them (and a lot more) in life.